The global financial system is under a staggering amount of debt. And this time, it’s much bigger than just the housing market. Today we have ballooning emerging market debt, subprime auto debt, shaky corporate debt, and student loans. Did you know students have borrowed over $1 trillion for college? While student debt mounts, wages stagnate and jobs disappear. The average 40-year old head of household in the U.S. today spends more on servicing student debt than on food each month. We predict this debt will never be repaid. Likewise, the high-yield debt market is turning over. High-yield bonds (aka “junk”) are sold by the riskiest corporate credits. And investors, hungry for any extra yield, have happily loaned these sub-par credits over $1 trillion… an all-time record. Also, the two fastest-growing sectors of the high-yield market have been oil and gas companies and bonds tied to subprime auto loans. Energy companies have been crushed with the plunge in oil prices. And subprime auto loan defaults are ticking up. What’s more, many individual investors have loaded up on junk bonds through exchange-traded funds (ETFs). But the supposed liquidity of these ETFs don’t match that of their underlying assets. And when we see the market turn down, it could take months to liquidate these risky bonds… The ETFs, meanwhile, promise daily redemptions. In other words, individual investors will get crushed. It’s a ticking time bomb that will blow up in the next recession (which we expect very soon). Are you prepared for the repercussions of this massive default? James Altucher * Marc Faber * Gerald Celente * Richard Maybury * Scott Taylor * Frank Trotter * Louis James * Bud Conrad * Terry Coxon * Nick Giambruno * E.B. Tucker and others . . . Global markets are bloated with unprecedented levels of government-created liquidity and manipulated for political ends, the true condition of the crisis economy cloaked in a fog of media hype. For most people, the crisis economy is going to end very, very badly. We’ve brought together an unprecedented group of over 31 all-star experts in the fields of economics, geopolitics, investments, investigative journalism, real estate, and international law to help you survive and thrive in this Crisis Economy. Alex Jones * Justin Raimondo * Charles Biderman * Mish Shedlock * Nick Giambruno * Doug Casey * Paul Rosenberg * Stephen Moore * Pete Kofod… and that’s just for starters! 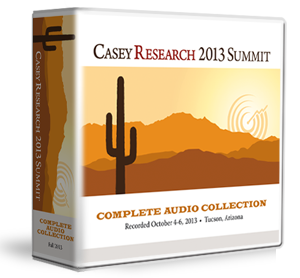 The Casey Research 2013 Summit brought together an unprecedented group of experts in the fields of economics, geopolitics, investments, health, real estate, and international law. 37 speakers – addressed the very real threats facing Western economies and markets… as well as every independent-minded individual seeking to safeguard his liberty, his wealth, and his health. Most of us still remember the times when you could have invested in just about anything – even a market index fund – and gotten respectable annual returns. Alas, those days are gone, and maybe for a long time to come. In today’s politicized economy, only the most astute and aware investors still have a chance to make consistent, inflation-beating gains. And the expert presentations by our blue-ribbon faculty will go a long way to help you accomplish that goal. Your financial well-being is nothing to gamble with. 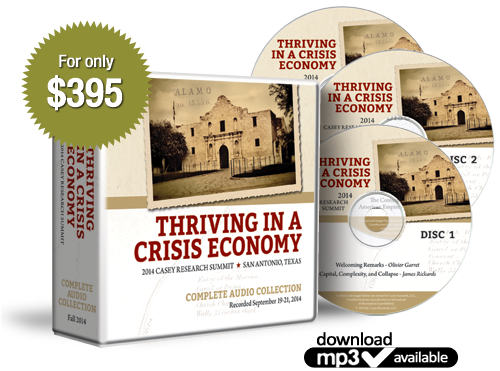 And there’s no better way to protect and grow your wealth than to get your copy of the Summit audio collection Navigating the Politicized Economy. Listen in as a master – class of serious investors reveal their visions for the world economy – and specific strategies any investor can use to protect and grow wealth… no matter which way the economic winds blow. With the world’s currencies looking shakier by the day, investors are left to wonder… what’s next? What impact will the sinking global economy have on the markets? And how do you protect your financial future in the face of all the economic uncertainty? These questions and many more were answered at the Casey Summit – When Money Dies. What’s coming next in the global economy and investment markets? Is The Greater Depression imminent… Or is it here already? How do you protect your wealth and wellbeing regardless of what happens? What are the best opportunities to profit in an uncertain – even turbulent – market? Is gold the best investment today, or are better opportunities developing? We asked these and other pressing questions… Now you can listen as the best and brightest share their answers. With the gold bull market already having lasted over a decade, how much further can it run? How high can gold go? And how will you know when the gold bull market is coming to an end? Taking value, volatility, risk, and liquidity into consideration, what are the best ways to invest in gold at this point in time? Which of the junior resource companies are now your best bets for the big speculative upside? Those topics and much, much more, including where the economy is headed next and the outlook for other investment classes, were covered at Casey’s Gold & Resource Summit. The period of relative calm in the global economy is coming to an end. The next phase in the global debt crisis is beginning to unfold. Thoroughly understanding the powerful economic forces now at work has never been more important. Likewise, stepping away from the daily grind to undertake a comprehensive review of your personal portfolio, and of the opportunities inherent in every crisis, is not just important but imperative. Doug Casey has often said that in a crash, no one comes out unscathed. With foresight and advanced preparations, however, you can do far, far better than most. And given the scale of the challenges that lay just ahead in 2010 and beyond, the time to prepare is running short. Make no mistake, energy makes the world go round; it is a massive component of the global economy, offering an equally massive array of serious profit opportunities. Those opportunities can be found in everything from the green energy that’s the current darling of politicians everywhere, to the opposite end of the spectrum, coal, which actually provides the bulk of the world’s power. The energy spectrum includes petroleum, natural gas, nuclear, geothermal, hydroelectric (including run-of-river), biofuels, wind, solar… plus, all of the many technology and service companies that provide the support necessary to bring the energy to consumers in an efficient and economic manner. Reviewing that list – and it is an incomplete list – two things become clear. First, there are a lot of opportunities for informed investors. But, second, sorting through the energy sector to identify the very best-of-the-best opportunities requires serious expertise and a lot of hard work and analysis. The mandate of our first-ever Casey Research Energy & Special Situations Summit is to bring you face to face with the experts, and to allow you to “download” their best intelligence and investment recommendations. Amid a widespread clamor for ever more government intervention in the economy, the free market is on the run. In fact, it is now estimated that the U.S. government will account for $1 out of every $4 spent in the economy in 2009. Greatly exacerbating the situation is the worst economic crisis since the Great Depression, a crisis that looks to extend well into 2010, and maybe beyond. For investors, the situation is dire and yet at the same time ripe with potential. This Crisis & Opportunity summit is designed to provide you with the comprehensive understanding of the U.S. and global economy you’ll need to persevere and even prosper in the challenging months and years just ahead.